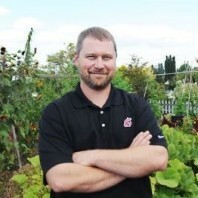 Chad Kruger directs WSU’s Northwestern Washington Research & Extension Center (NWREC) in Mount Vernon, the Puyallup Research & Extension Center, and the Center for Sustaining Agriculture & Natural Resources (CSANR). He received a B.A. in Philosophy and History (1997) and an Academic Certificate in Ecointensive Agriculture Technologies (1998) from Northwest College in Kirkland, Washington, and he completed an M.S. (2003) in Land Resources from the Gaylord Nelson Institute for Environmental Studies at the University of Wisconsin – Madison. He was an Au Sable Graduate Fellow at the University of Wisconsin – Madison. He has served on the 2007/2008 Washington State Climate Action Team, co-chairing the Agriculture Sector Carbon Market Workgroup; the 2010 Washington State Climate Change Working Lands Technical Advisory Group; the Washington State Energy Strategy Technical Experts Panel; the Northwest Regional Biocarbon Initiative, member of the Washington Department of Natural Resources Expert Council on Climate Change, and was a Commissioner on the Douglas County Water Conservancy Board. He is currently a board member for the Northwest Ag Business Center and serves on the Advisory Board of the Northwest Environmental Forum. He was raised in Washington State and has family roots in agriculture in both Eastern (wheat and cattle near Spokane) and Western Washington (berries in Whatcom County). FireEarth: Advancing Reslience to Compounding Disasters: An Integrated Natural-Human Systems Assessment of Wildfire Vulnerability. NSF Hazards SEES.